Don't miss out on our brand new Clothing and PPE Catalogue. Order your copy today! Time to celebrate! We have achieved our accreditation for ISO 45001. It’s staggering to note that 5 people per day get skin cancer from sun exposure at work – that’s higher than Australia. However, 90% of skin cancer deaths can be prevented. 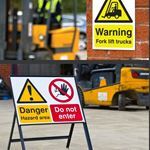 Looking for a quick guide to different types of safety signs? Check out our summary here. We are so excited to announce that our new website has gone live! Are you going to be at Housing 2017 in June? We'll be there to provide you with innovative ways to efficiently control your ordering of Uniform & PPE. Register for free pass and join us on stand P52. From 23 May 2017, we are closing our trade counter and offering a brand new Click & Collect service for online ordering.